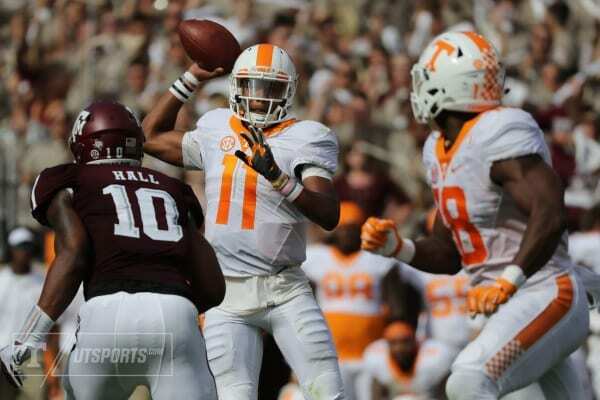 Tennessee committed seven turnovers against Texas A&M on Saturday. Here is how each position group graded out in the Vols’ 45-38 double-overtime loss. Despite looking like Tennessee was going to finish another miraculous comeback, the Vols couldn’t overcome seven turnovers, 15 penalties and a rash of injuries to key defensive players in their 45-38 double-overtime loss to Texas A&M. Here are how the positions graded out. Senior Josh Dobbs followed his impressive performance against Georgia last week with his second-best performance of the season. The senior completed 28-of-47 passes for a career-high 398 yards and a touchdown. Although his completion percentage won’t turn heads, Dobbs threw a handful of accurate passes that only fell incomplete due to excellent plays by Aggie defensive backs. As a runner, Dobbs ran for 57 yards, but 33 of those yards came on a single run in the first quarter. Dobbs also had a receiving touchdown from a Jauan Jennings pass on a trick play. However, he also threw a pair of interceptions. The responsibility of the first interception is solely placed on his target, but Dobbs cannot be forgiven for his second interception. After completing another improbable comeback, Dobbs opened the second overtime period with a downfield shot that sailed right into the arms of a Texas A&M defender. Given the situation, the quality of that decision and throw downgrades an otherwise memorable performance. It was a field day for the Vol running backs. While Jalen Hurd out with an undisclosed injury, the duo of Alvin Kamara and John Kelly combined for 216 yards rushing on only 31 carries — almost seven yards per carry. Kamara excelled at finding holes and making moves in open space. Meanwhile, Kelly bruised his way through multiple tackles and gained most of his yards after contact. Kamara finished the game with 127 yards rushing and 161 yards receiving and three total touchdowns. According to ESPN Stats & Info, Kamara is the only Power Five conference player over the past 20 seasons to have at least rushing 125 yards and 150 yards receiving yards in the same game. Normally, a combined performance of that caliber would result in an A+, but both Kamara and Kelly fumbled. In a seven-point loss, turnovers are usually the difference. Jauan Jennings was without an explosive play, but executed the role of a dependable immediate receiver well, reeling in five catches for 68 yards. Freshman wide receiver Tyler Byrd came up with a huge 43-yard catch-and-run during the game-tying drive and finished with 60 receiving yards on the afternoon. No other wide receiver cracked 50 yards, as Josh Malone finished with two receptions for 31 yards, while Josh Smith managed to gain only four yards on three catches. The receivers actually managed to limit the drops against Texas A&M. Tight ends Jason Croom and Ethan Wolf did a nice job blocking, but didn’t contribute much in the passing game (5 receptions, 55 yards). Croom also bobbled a gorgeous pass from Dobbs that was intercepted. It appears that the offensive line mishaps are beginning to diminish for the orange and white. The front five wasn’t flawless, but considering that the five squared off against one of the nation’s premier front sevens, they performed admirably. In the first half, the offensive line provided Dobbs with a consistently clean pocket, allowing only three pressures total. However, once the Aggie began blitzing in the second half, the pass protection broke down. In total, Tennessee allowed nine pressures during the second half and overtime. In the ground game, the front five was inconsistent. When the majority of the Vols’ yards on the ground are made after contact, then the offensive line isn’t providing enough space for the runners to navigate through. Another week, another performance from the defensive line that left a lot to be desired. Derek Barnett was unstoppable in the first half, recording five pressures and a sack, with one of his pressures resulting in an arrant Trevor Knight heave that was picked off. However, the defensive front slowed down considerably in the second half. They didn’t challenge Knight enough in pass situations, which left a depleted secondary in dangerous one-on-one situations. In the ground game, there were too many instances where the unit was pushed backward or forced inside on outside runs. In order to cover up the glaring holes in the back seven, the defensive line must put together a 60-minute performance. The linebackers deserve credit without Jalen Reeves-Maybin and Darrin Kirkland Jr. There were missed tackles and lapses in coverage, but given that the rotating players at the position resembled a game of musical chairs, the linebackers held their ground. Colton Jumper continues to silence doubters and make strides. The senior finished with a team-high 10 tackles and showcased excellent tackling in the open field. Injuries marred the performance of no position group more than the defensive backs. Knight finished with only 234 yards through the air, but there were countless situations where Aggie receivers had the Vol defensive backs beat, but thanks to Knight’s usual accuracy issues, passes fell incomplete. The only saving grace for the unit was Todd Kelly’s interception, but that came on the game’s first drive. Malik Foreman made a pair of impressive plays. His tip led to Jumper’s interception and his forced fumble on a breakaway run by Trayveon Williams saved the game, but the quality in coverage was lacking all afternoon long. Nothing spectacular happened on special teams for Tennessee on Saturday. Aside from an impressive punt by Trevor Daniel from his own end zone and a solid kickoff return by Evan Berry, the Vols’ most consistent position group had arguably its worst performance of the season. Smith and Kamara combined for 24 yards on four punt returns, while Berry fumbled in a pivotal spot that set up a Texas A&M score in the first half.